The Rev. Dirk C. Reinken became the 37th Rector of St. Peter’s Church on July 1st, 2014. In coming to Freehold, NJ he joined a list of clergy dating back to 1702 when the Rev. George Keith held the congregation’s first services. He brings with him experience in business, marketing, and state government. Father Dirk grew up in South Carolina, and is a 1987 Graduate of the University of South Carolina. While in college, he was active at Trinity Cathedral in Columbia, and worked for a SC State Senate committee. After graduation, he was an assistant marketing manager at a mall in Raleigh, NC before moving to Providence, Rhode Island where he worked in human resources for a start-up clothing manufacturer and then for the state’s AIDS service organization. 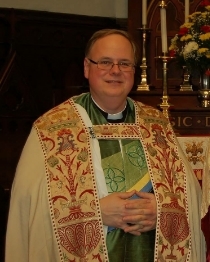 He brings that varied background into parish ministry, having been ordained in 1999 and serving at St. Luke's Church (Germantown) in Philadelphia, PA and St. Luke's Church, Ewing, NJ before accepting a call to become the 37th rector of St. Peter’s Church, Freehold, NJ. In addition to parish ministry, Father Dirk has been active in ecumenical efforts, including the Episcopal Church’s national dialogues with the Roman Catholic Church and the Presbyterian Church. In 2008, he represented the Episcopal Church at the 218th General Assembly of the Presbyterian Church (USA). Other honors include being a recipient of 2010 Clergy Renewal Grant from the Lilly Endowment, which allowed Father Dirk to spend three months on sabbatical in South Africa to learn how the Anglican Church helped bring about the end of Apartheid and fostered reconciliation in the country’s transition to democracy. Prayer, Liturgy, Spirituality and Christian Formation are areas of particular passion for Father Dirk. He looks forward to teaching opportunities with members of the Congregation as well as ways to use technology to make Christian formation more accessible and inclusive in the home. He is an Associate of the Order of Holy Cross, and Epsicopal monastery in the Benedictine family, and loves to bring themes of the Benedictine balance of work, study, and prayer into discussion of the spiritual life. Father Dirk supports the ministry of the Diocese of New Jersey through service on several committees including Committee on Priesthood. Locally, he is active with the Freehold Clergy Association and looks forward to becoming more engaged with community life. His major heroes are Bishop George Bell of Chichester, England, who was one of the primary leaders of the Ecumenical Movement in the 20th Century as well as a voice for reconciliation following World War II and Archbishop Desmond Tutu of South Africa, whose prophetic witness helped South Africa end apartheid and begin to move forward into a new era of reconciliation. In his personal life, he is married to the Rev. T. James Hargrove, also an Episcopal priest and hospice chaplain. They live in Freehold Township as staff to their Siamese cat Clare and companions to their Tibetan Spaniel mix Ludwig. His other interests inlcude music, theatre, history, and Disney.